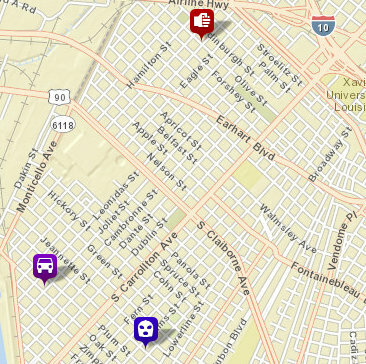 Map shows an auto theft in the Riverbend, a carjacking on Willow and a shooting in Hollygrove all linked to Ken Dooley on Monday, police said. A man has been arrested in the Monday afternoon carjacking of a woman on Willow Street after what appears to have been a short crime spree that began with a car theft on the Riverbend and ended with a shooting in Hollygrove, police said. While the incident appears to be related to two subsequent armed robberies on Tuesday, investigation continues into both of those cases as well, police said. Ken Dooley, 20, approached a woman around 1:15 p.m. at Willow and Adams who was cleaning the windshield of her Lexus SUV, pointed a gun at her, demanded her keys and drove off in her vehicle, police said. The vehicle was then located about 20 minutes later in the 1700 block of General Ogden. Around 10:15 p.m. Monday, a man was shot in the shoulder by someone firing from a dark-colored vehicle near General Ogden and Olive streets in Hollygrove, but police saw the vehicle leaving the area and followed it to the intersection of Colapissa and Mistletoe, according to a news release. The occupants bailed out, and Dooley was arrested after a short foot chase, police said. Dooley identified Robashi Holmes, 18, as the shooter in the Hollygrove case — as well as the victim of a July 12 shooting on an RTA bus at Carrollton and Palmetto. Police are still looking for Holmes and are hoping that the public can help locate him, the release states. While detectives were interviewing Dooley, a Lexus key fell out of his pocket that matched the SUV stolen from Willow and Adams, and the carjacking victim was able to identify Dooley as her attacker, police say. The car used in the Hollygrove shooting had been reported stolen from the 1200 block of Joliet Street around 1 a.m. Monday, using a spare key that had also been stolen in the burglary of another car. Dooley was also charged in connection with those cases as well. Dooley is charged with armed robbery, principal to aggravated battery, simple burglary, possession of stolen things and flight from an officer. Dooley’s case does not appear to be related to two subsequent robberies on Bordeaux Street and Clara Street, said NOPD Commander Paul Noel of the during the weekly Second District leadership meeting. But prints were recovered in the Clara Street case, and detectives are working several other angles as well, Noel said. “We do have some good investigative leads we’re working on,” Noel said.